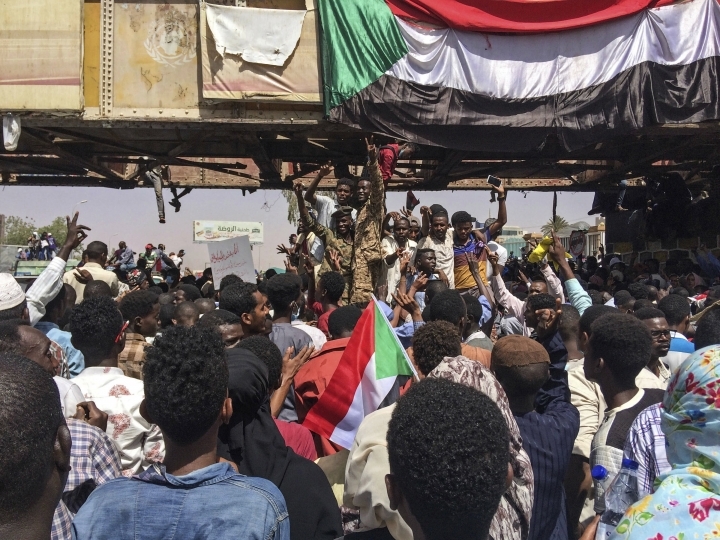 CAIRO — Clashes between Sudanese security forces and protesters holding a large anti-government sit-in outside the military's headquarters in the capital Khartoum killed at least 11 people including six security forces, the government's spokesman said Wednesday. Information Minister Hassan Ismail, who also serves as the Sudanese government spokesman, did not give further details on the violence a day earlier. Sudanese security forces tried again to break up the sit-in, which began over the weekend, killing at least 14 people on Tuesday, activists behind the demonstration said, disputing the government's figure. Attempts by security forces to break up the sit-in have killed at least 22 since Saturday, including five soldiers who protest organizers said were defending the sit-in. The demonstration is the latest in nearly four months of anti-government protests that have plunged Sudan into its worst crisis in years. The protests initially erupted last December with demonstrations against a spiraling economy, but quickly escalated into calls for an end to embattled President Omar al-Bashir's 30-year rule. Sudan's state news agency, meanwhile, said the country's ruling party would hold a rally Thursday in support of al-Bashir in Khartoum. But the party said later that it had canceled the rally for security reasons. A photo of a woman protester in a traditional white Sudanese dress and golden, moon-shaped earrings went viral on social media, instantly becoming a symbol for the role of women in the uprising against the autocratic leader. The image drew a comparison to America's Statue of Liberty and the ancient Nubian Sudanese queens known as kandaka who live on in Sudanese folklore as women who accomplished and sacrificed for their country. Her white dress is traditionally worn by professional Sudanese women in the workforce, said Hammour Ziada, a Sudanese novelist. "The outfit is symbolic of the identity of a working Sudanese woman that's able to do anything and at the same time keep her culture and traditions," he said. Video circulating online showed the woman, Alaa Salah, singing traditional songs to protesters in the sit-in outside the military's headquarters. She chanted: "They burned us in the name of religion, killed us in the name of religion, jailed us in the name of religion," while a crowd around her shouted "revolution." The image was taken by activist Lana Haroun on Monday during the third day of the sit-in outside the military's headquarters. It has since received 55,000 likes and was picked up by Twitter Moments. The protests against al-Bashir gained momentum last week after Algeria's President Abdelaziz Bouteflika, in power for 20 years, resigned in response to weeks of similar protests. Saturday's marches marked the 34th anniversary of the overthrow of former President al-Nimeiri in a bloodless coup. It was one of the largest turnouts in the current wave of unrest. The military removed Nimeiri after a popular uprising in 1985. It quickly handed over power to an elected government. The dysfunctional administration lasted only a few years until al-Bashir — a career army officer — allied with Islamist hard-liners and toppled it in a coup in 1989. Al-Bashir has banned unauthorized public gatherings and granted sweeping powers to the police since imposing a state of emergency last month, and security forces have used tear gas, rubber bullets, live ammunition and batons against demonstrators. Security forces have responded to the protest movement with a fierce crackdown, killing dozens of people. Copyright © 2015 - 2019 Lifestyle - Morning Dispatcher. All Rights Reserved.